For reference, below is my Class of 2015/16’s “M.A.D Journey”. Hello! Thank you for you interest in our Make a Difference Project! You can follow our class journey as we each strive to go M.A.D! This page is arranged in reverse chronological order, starting with our first steps, so please scroll down to follow our incredible journey from start to finish! **Interested in joining our M.A.D project? Visit Mr.C’s SharesEase M.A.D Project Resources. Please let us know that you are joining us! We are about to embark on a M.A.D (Make A Difference) journey! The intent of this project is to make a difference in our own lives and the lives of others in an attempt to make the world and even better place! Stories of kids taking steps to make a positive difference in the world are all around us! Josh- Opening Doors and Hearts and Cuddles for Cancer are two great examples of simple ideas that have made a huge difference! Here are two more M.A.D ideas: My Garden and Neighbourhood Clean Up. Students will have ample time to work on their M.A.D project at school but they’ll also require time to work at home as well. Please visit this webpage often to help your child keep up with the timelines outlined below. Thanks for helping to make a difference! This week students will be brainstorming questions and then selecting one question they would like to answer to help drive their M.A.D project. *Please note, reflection and refining should be taking place during all phases of the project! If students have selected their question, they may start researching to find ideas to help answer their question. Our M.A.D Questions are Picked! The research phase has begun. Students have been discussing their M.A.D questions with their peers and sharing with our class as a whole. They are exploring possible ideas to help answer their questions while doing research on the internet, talking to their parents and people in our community. The intent of the “research” phase is to help students to come up with a good idea to put into action which will help them make a difference. By the end of this week students should have an idea of how they are going to answer their question. When their idea is put into action the “making a difference” part of their project will actually begin! This week is dedicated to making a plan to put your idea into action. What steps will you need to take put your idea to take a difference into action? Careful planning will be the key to success! Don’t forget to consider any “road blocks” that you may encounter. Also remember to reflect and refine as you plan! We are now all at somewhat different stages of our M.A.D project and this is ok! Some students are still on the planning stages to put their idea into action. Others are already following through with their plan and have started to put their idea into action! The action stage is where we start to make a difference! Here’s a great example of a team who has started to put their plan into action: M and C’s question was “How can we help the animals at the Humane Society?” After careful research and consultation with their parents they came up with the idea of going to the Humane Society to volunteer to help out with the animals. Part of their plan was to go with their parents to the Humane Society to find out about volunteer opportunities (they did this last weekend). Today, M and C came to school with huge smiles on their faces!! I met C in the hall and he told me that he and M had gone to the Humane Society with their parents to volunteer this past weekend. They cleaned cages, cuddled kittens, folded laundry and took a dying dog for a walk. They shared their actions with our class and can’t wait to go back next weekend to continue to make a difference! Road Blocks! While discussing our M.A.D projects J and A stated that they had hit a “road block”. Their question is “How can we help people on snowy days?” They were planning on shovelling neighbours’ driveways on snow days. The problem? We recently had a huge “meltdown” in Thunder Bay and there is no snow in the forecast sight. It was great to hear them think out loud but I was surprised they hadn’t thought a little outside of their box to have a “Plan B”. They were looking for my feedback and input to move them forward. I was reluctant to provide it as I truly want this to be their project. After more discussion and pushing on both my part and their peers, I finally said, “Guys, look outside!” ICE is everywhere. “AHHHH, we could salt and sand peoples’ driveways!”, the boys exclaimed! Road block averted and “Plan B” put into place! It’s time for us to reflect on and share our progress on our Make A Difference Journey so far. All students started their reflection in class on Thursday and are expected to have their report completed by Monday February 29th. Students can access their Google Classroom assignment and the document they started by using the log in information First name.Last name@tbcschools.ca and their password. Parents, please have your child complete their assignment and read it to you. 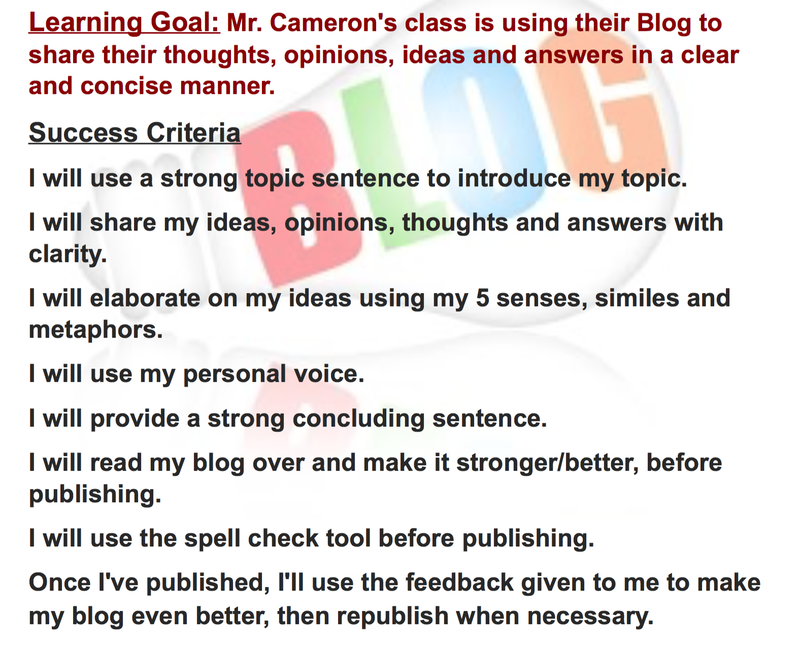 It would be GREAT if you could give them a little feedback using this Success Criteria as a guide. Below is a sample of one student’s report. It needs to be finished, but he certainly is on the right track! Week Five Our Plans are Complete! By now, all plans for our Make A Difference project should be completed! Many students have included their idea for action and how they intend to share as well! Many students have now started to put they M.A.D plans into action. **The ACTION must take place by no later than Monday, March 21. Read below to find out how some of our students have already completed their action steps! Please make sure you take photos to record your M.A.D journey and with the help of your parents, share your M.A.D story! A student who made and served gourmet hot chocolate to our students and raised $157.00, which she will donate to families in need. Two boys sold duct tape, $1 for 1 meter of duct tape and $2.50 for 3 meters. The duct tape was used to tape Mr. Cameron to the gym floor during lunchtime. The proceeds they raised (close to $200) will be donated to Doctors Without Borders. Two boys salted and/or swept/shovelled their neighbours driveways over a weekend. Another pair have started to volunteer every Saturday, with their parents at our local Humane Society. Two other students made “special” Easter Eggs, sold them and then purchased Easter dinners to donate to our local Shelter House. One boy is making blankets with his mother to donate to the Humane Society. He would like to volunteer there, but he is allergic to cats! On Thursday March 10 our Member of Parliament, Don Rusnak, stood in the House of Commons and pledged to join our Make A Difference Project!! He also challenged other MPs to do the same! Please share Mr. Rusnak’s speech with everyone you know and challenge them to join our M.A.D project! It is now time to SHARE all the great ways that we have MADE A DIFFERENCE! Parents, please brainstorm with your child how they can share their M.A.D projects with others (including relatives, friends, neighbours) throughout the world. Be creative (social media,email, posters, word of mouth…). It is hoped that by sharing our stories others will be inspired to join our Make A Difference as well. Please include the link to our webpage when sharing. Parents, please email me (pcameron@tbcdsb.on.ca) any photos, links to social media that young your child would also like me to share on our blog! When we have done something good, we should be proud to share! Let’s spread our GREAT news throughout the world! (A great example of the result of Evan’s sharing is to the right). Our M.A.D Fair is scheduled for Friday April 8 from 11:30-1:00 in the St.Elizabeth School gym. Our class will have the opportunity to share their Make A Difference success stories with the rest of the school community! Students will be required to display their M.A.D project using a platform of their choice (bulletin boards, photos, booklet, posters,etc). They must share what their M.A.D project was and how it made a difference. The displays must also inspire others to make a difference. All displays must be completed Thursday April 7, one day prior to our Fair. (See below for a great example of a display). Parents, grandparents relatives and friends are welcome to come by the school to learn about and be inspired by all of our students’ M.A.D. projects! Please join us! Mason and Copper went “above and beyond” by creating a video for our M.A.D Fair to compliment their display! The Day has Arrived! Our M.A.D Fair! Our M.A.D Fair was a complete success! Our school community was inspired by each of our efforts to do good. We were happy excited to share with our peers, teachers, parents, grandparents, great grand parents, relatives and friends what we did to make a difference and who we made a difference for! We were also excited to have Sandy Kronowski, a reporter from the Chronicle Journal join us and read her article ‘Project Shows How to Improve World’! Enjoy the video below that captures the success of all the Make A Difference projects at our M.A.D Fair! The M.A.Dness NEVER stops! Our M.A.D Fund! Miss Cedarwell, our student teacher, took up a Make A Difference project of her own. She organized a M.A.D Bake Sale which our class hosted for the St. Elizabeth School community! We raised an astounding $633.10 which we decided to put into a “M.A.D Fund” Bank account that our class will use to make a difference when we find a worthy cause. Next STEP? Let’s GO GLOBAL! We hope our M.A.D snowball will keep on growing and that other schools will take on our Make A Difference challenge! Please join us!